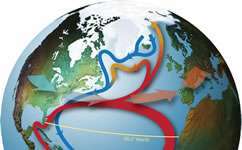 The North Atlantic and Arctic Oceans are critical components of the ocean-climate system. "Satellite data has shown us that a dome of fresh water has been building up in the western Arctic over the past 15 years, due to the wind. 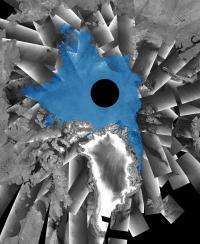 Our findings suggest that a reversal of the wind could result in the release of this fresh water to the rest of the Arctic Ocean and even beyond," says Dr. Katharine Giles from the Centre for Polar Observation and Modelling (CPOM) at University College London, lead author of the study, published in Nature Geoscience. Earlier studies from ships, submarines, and instruments on moored buoys had pointed to increasing volumes of fresh water in the Arctic over the last few decades, especially in the western Arctic. Not only that, but other studies had found that less fresh water reached the Atlantic than expected over the same period of time. These findings suggest the water is concentrated in the Beaufort Gyre, and can't spill out into the Atlantic. But all of these studies relied on limited observations, so scientists weren't sure exactly what was driving the changes. 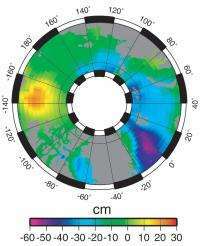 Climate models had suggested that the action of the wind on the sea surface could cause a raised dome to form in the middle of the Beaufort Gyre. But until now, there had been no continuous observations of sea-surface height to demonstrate this categorically. Now, using satellite data from 1995 to 2010, Giles and colleagues from the National Oceanography Centre (NOC) have found that the height of the sea surface in the middle of the Beaufort Gyre has increased substantially since 2002. "We were surprised to find that our results also suggested that something else was going on,' says Giles. 'When we looked at our data on a year-to-year basis we noticed that the changes in the sea surface height did not always follow what the wind was doing so we thought about reasons why this might happen. 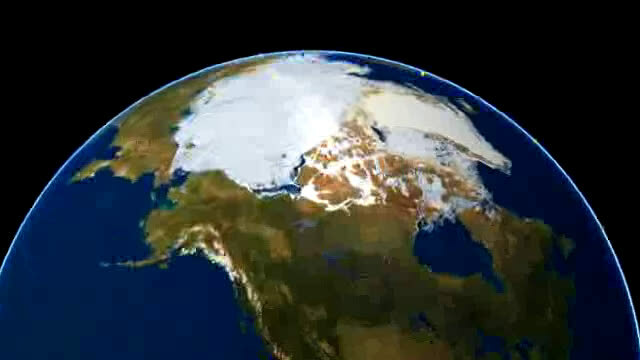 One idea is that sea ice forms a barrier between the atmosphere and the ocean. So, as the sea-ice cover changes, the effect of the wind on the ocean might also change." "Our next step is to look into how changes in the sea-ice cover might affect the coupling between the atmosphere and the ocean in more detail to see if we can confirm this idea,' she adds. "Satellites have been measuring how the ice is changing for many years but we now have the tools to monitor how the ocean underneath the ice is changing. These techniques can also be used with the recently launched CryoSat-2 satellite to measure changes over the whole basin,' says Dr. Seymour Laxon, director of CPOM and co-author of the study. Yup. What goes around, comes around. Cycles exist. They change direction. Co2 doesn't cause cycles, conmen blame natural cycle changes on CO2. This article is far to secular to be of value.